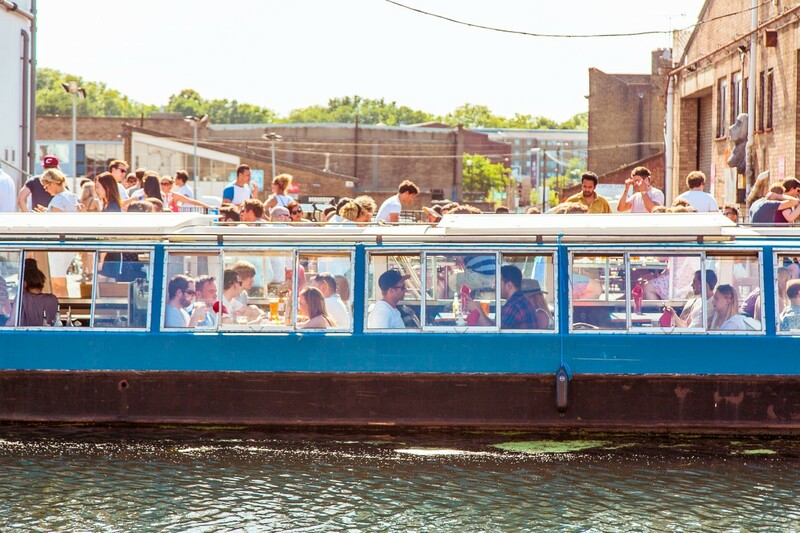 The ALFRED LE ROY is a classic British wide beam canal boat based in East London's burgeoning Hackney wick, literally a stone's throw from the Queen Elizabeth Olympic park. 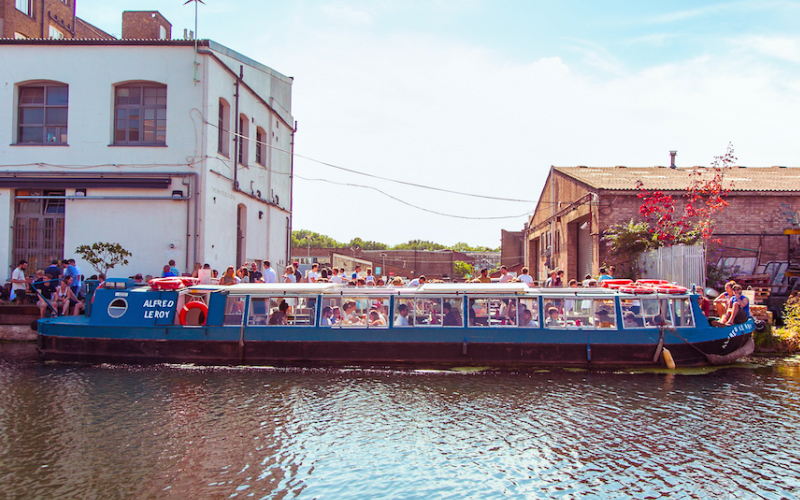 Able to cruise the famous 'East end' canals including the River Lea, Regents canal, Limehouse Cut and Hertford Union canal, as well as available for static hire with use of our shared canal side terrace. Alfred, named after a famous Belgian pub landlord back in the ‘70’s is distinctly different from most other boats on the canal. Step inside, and once onboard you’ll find yourself in a surprisingly spacious and subtly lit cocktail bar with tables and comfy booth seats, playing a mix of eclectic tracks from the integrated sound system. This wonderfully versatile venue now offers a unique canal experience. Summer sees our retractable roof open wide to let the sunshine in, making it nice and airy, whilst in winter, the boat becomes a warm cosy space. There are windows all around so everyone gets a view. The decadent drinks list includes a selection of five speciality cocktails, alongside the classics, a range of craft beers and cider from CRATE Brewery, as well as spirits, wines and prosecco for those special occasions. The boat makes for a personal and intimate venue – with an onboard capacity of 55 while static, 50 while cruising, 40 at our booth tables and 10 in our front cabin bay seats. We have an onboard PA system, Wifi, and double 240v sockets at every table. There is a customer toilet and we accept cash and card payments including contactless and apple pay. With professional skipper & crew, alcohol license, and even beer on tap. The Alfred Le Roy has won critical acclaim from many publications including Evening Standard, Metro, Telegraph, Elle, Coach Magazine, Lonely Planet, Fabulous Travel guide, Time Out, Sheerluxe, Jamie magazine (Jamie Oliver), Waitrose Food, London on the Inside, Country & Townhouse, Metropolitan (eurostar), Red magazine, amongst many more. Entrance welcome area, with bar. Main vessel cabin has 4 rows of table booth seats grouped with tables of 4 on the port side, and tables of 6 on the starboard side. There is seating for 10 in the front bay seats leading to the front deck. Great afternoon in an unusual setting. We brought our own food onto the boat which worked well. The cocktails were delicious and the service was always with a friendly smile. Definitely recommend.